Welcome to Printmaking 101 with Smidgeon Press! This demo covers applying rosin to copper plate to create aquatint etchings, using a rosin box. This is Part 1 of 2, of my aquatint tutorial. Safety tips are bolded because they’re important! Aquatint is a way of working with tone, so you don’t have to rely only on lines and step-biting to create variations in darkness on your plate (though Rembrandt never used aquatint, and some contemporary artists like DeAnn Prosia don’t either). Essentially, we’re going to cover a copper plate with teeny-tiny little specks of (in this case) rosin that will act as a stop-out (something that prevents the mordant from etching a particular area of the plate). This will allow an infinitesimal number of little pockets to get bitten (etched) into the plate, creating little “cups” where ink can stick during the printing process. How deep those cups are will determine how light or dark the tone will print, because deeper cups will hold more ink and shallower cups will hold less. With me so far? (This is usually where my new students give me a glazed look accompanied by some vague nods.) This is involved process, so bear with me. Rosin is a natural substance: purified sap of pine trees. You can buy it as lump rosin, then pulverize it for use in aquatint (using a good old-fashioned mortar and pestle, or a coffee grinder–either way, dedicate them to the purpose; do not share food preparation items with your studio). While it is classified as non-hazardous, powdered rosin is dangerous to breathe in–it’s fine if you touch it, but the second it gets moist, it becomes intensely sticky. You can imagine the damage it will do in the moisture-rich, delicate tissues of your lungs, so wear a dust mask and eye protection when working with powdered rosin. Rosin can be cleaned up while dry by thoroughly dusting surfaces. When damp and sticky or melted, you will have to use denatured alcohol. Printmakers interested in non-toxic processes often eschew rosin for these reasons. You can read about methods for making aquatints without rosin here. aquatint box design and diagram by Annamie Pretorius (AKA inugie). As you can see, the box has a flap on the front that opens. This is how you will insert and remove your plate. Inside, there is a rack; this is what your plate will rest on. Below that, there is a paddle system that can be turned by a hand crank. The box I’m using functions on the same principle. There are other methods of applying rosin to your plate, of course. Francisco de Goya applied powdered rosin by hand. He used variability in the size of rosin particles and areas of application to great effect (see: Los Caprichos). You can find a nice tutorial on that process over at Wretched Etching. First, make sure your plate is well and thoroughly clean and degreased. Anything on the surface of your plate (including fingerprints and solvent residue) with affect how the rosin melts to your plate. Be courteous! If you’re in a shared studio, make sure the rosin box is not already in use. If someone else’s plate is already in there, turning the crank will make a real mess of their plate. Peek inside if you’re not sure. If someone else is planning to use it at the same time and your rosin box is large enough to accommodate multiple plates, you can coordinate the next steps. Put on your protective gear: dust mask without question; for extra safety/sensitivities: apron, goggles and gloves. Remember, powdered rosin is dangerous to inhale and potentially harmful for any moist tissue. It is also messy, hard to clean up, and will dry out your skin. 3M 8511 Particulate N95 Respirator. This mask is approved for non-oil-based particulates (like rosin). Make sure the rosin box is tightly closed, then crank the hell out of that handle (nicely). Be sure to turn it in the correct direction; mostare designedto function well in one direction only. If you turn it the wrong way, the fan blades can get stuck, and then you’ll have a real mess to deal with. Heather McLaughlin fixing jammed blades in a rosin box. The whitish powder all over her clothes and hair is rosin. Wait around 30-45 seconds. The heaviest (and thus largest) particles will fall in this time. Do the next step while you wait. 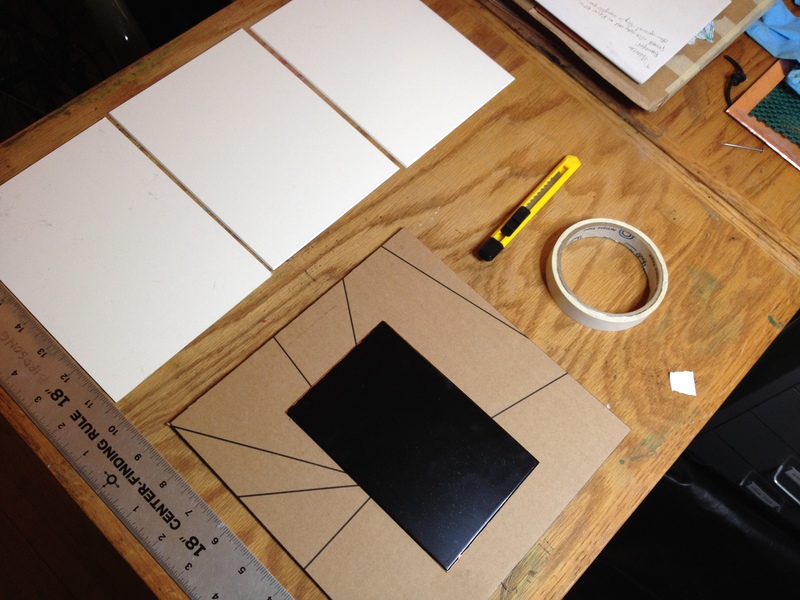 Plate set-up for inserting in a rosin box. If you look carefully, you will see that the backing board is set on a piece of newsprint. This is to minimize the spread of rosin powder around the studio. This is kind of tricky: the goal is to set your plate (and backing) inside carefully while acting quickly. As soon as you open the door, a could of rosin will waft out, and it will keep wafting out as long as that door is open and there is rosin to fall. You want it landing on your plate, not all over the studio! Carefully open the rosin box and pop your plate setup inside, ASAP. If you move too fast, you might accidentally slide your plate off the backing. Close the door quickly, but gently; slamming it can result in clumps of rosin falling on your plate. Leave your plate in for at least 4 minutes, and not more than 10 minutes. Leaving it in longer won’t hurt it, of course, but if other people are waiting to use the box, waiting longer is discourteous. You can remove your mask, etc. while you wait, but you will need to put them back on. If the coating is too heavy (i.e., there are distinctive, irregular clumps of rosin or you can’t even see your plate), reach in and knock it all off your plate, then take your plate out. Clean it well with denatured alcohol (3 times), and start over. If the coating is too light (i.e., you can see too much copper), carefully remove your plate setup, remembering to close the door, and repeat from step 4. This can happen if you wait too long to insert your plate or if the rosin box is getting low. This is about right. It could be a little heavier, but I’m satisfied. Whew! Getting the plate safely from the rosin box to the hot rack is the trickiest part. If you tilt the plate too much, breathe on it, or walk by a good draft, the rosin will move and clump on the plate. Rosin is flammable, and we’re about to light a fire. Exercise caution. Remove your gloves (if you’re wearing them). Grab the propane stove and matches. Turn the gas on low and light it. Slowly turn the gas up until you just start to see a few orange flames lick up out of the ring of blue flame (the orange flameshould not be consistent). If you have rosin on your hands, remember that it’s flammable. Holding the flame 2-4 inches below your plate, carefully and slowly move the flame around so that your plate gets heated evenly. Copper is a great conductor, but it should still take a couple of minutes (or more, depending on the size of your plate). Make sure your movements are steady and consistent; I follow a set pattern as I move around. Make sure you are actually reaching your whole plate, too; beginners often don’t move the flame far enough away from or close enough to their bodies,in relation to their plates. Side-to-side is less of an issue. This shows the movement pattern that I typically follow: back and forth, then side to side, repeat. While you carefully move the flame around, watch your plate. When the rosin melts, it will flash from whitish-yellow to clear. When it flashes clear, move the flame away and turn off the propane. Unmelted rosin on the plate. Rosin melted on the plate. The copper will be hot. Let your plate cool for around 15 minutes, or however long it takes to cool down enough that you won’t burn yourself when you touch it. The rosin, once melted to the surface of your plate, won’t be nearly as delicate as when it’s just powder, but you should still handle your plate carefully. You are now ready to etch aquatint (tone) into your plate. Next up: step-biting an aquatint! I decided to divide the application of rosin and the actual etching of the aquatint into separate tutorials. While they are both steps in the same process, each part contains a lot of detailed steps and information. Please check back for updates. It will likely take me 3-6 weeks to get that new tutorial written. I’m sorry to leave you hanging, but you can send me encouragement via the “Thanks!” button below. Until then, happy printing. Welcome to Printmaking 101 with Smidgeon Press! This demo will walk you through how to make plate carriers using a few readily available materials. Safety tips are bolded because they’re important! You have prepared and grounded your etching plate. You worked hard to get it ready, so how do you take it home or out into the field to draw without damaging the plate or the waxy ground? You could just wrap it in newsprint or drawing paper and toss it in a bag, but if anything rubs too hard against or pokes the paper, you may wind up with unintended texture on your plate known as foul-biting. Some printmakers prefer the rough randomness of this approach, but not me – I spent time getting that plate to a pretty polish, and I want to maintain control over my final image. When I took advanced etching and lithography at PNCA, Yoshihiro Kitai showed us a simple way to keep our plates in great shape while carrying them around. Over the years, I’ve modified somewhat what he initially showed me. For every plate, I make a carrying case specifically cut to fit it, and I label each case with the working title of whatever it holds. This is helpful when I’m shuffling through carriers looking for a specific plate to work on (I’ve accumulated plenty of these by now, all in process or waiting to be editioned). Measure your plate. You will want your mat board piecesto be larger. For small plates (6″ x 9″ or less), you can get away with ~1″ all around (so 8″ x 11″minimum for a 6″ x 9″ plate). For larger plates, I suggest at least 2″. Supplies to make a plate carrier. Choose a mat to be your center piece and set the other two aside for now. Place your plate in the middle and trace around it with a pencil. Because plates aren’t always perfect, I will usually note “top” and “bottom”. Set your plate aside. Trace around your plate, marking where you will cut a hole. Using the X-Acto knife and ruler, cut out the shape of the plate. Make sure you cut on a surface that is safe to cut into, and mind where your fingers are. I err on cutting to the outside of my pencil line. Cutting inside it can result in a hole that istoo snug. Pop out the center piece and set it aside. I cut to the outside edge of my pencil line. Grab one of the other pieces of mat. Line it up with the one you just cut to see how they will fit together. Trim edges to line up snugly if needed. Make sure you can still see your “top” and “bottom” marks. 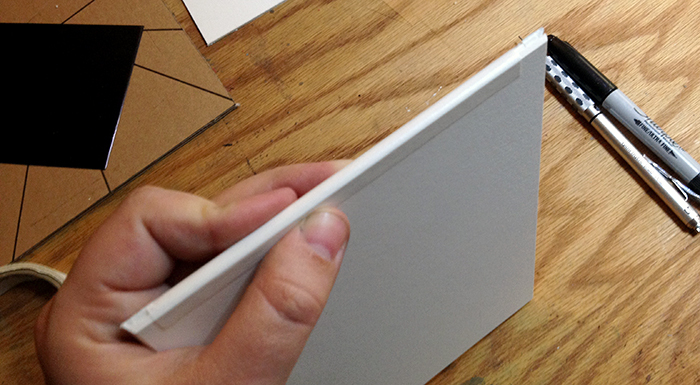 Cut a piece of artist tape is roughly 1/2″ longer than any one side of your mat’s outer edge. Lay it down on that edge, so that its lengthis centered to the mat, and a little more than half of its width hangs off the bottom. Carefully and snugly wrap the tape around the two mats, pressing all three sides carefully with your fingers (or burnisher, or bone folder). Repeat for all sides. Tape all four edges like so, trimming extra tape from the sides. 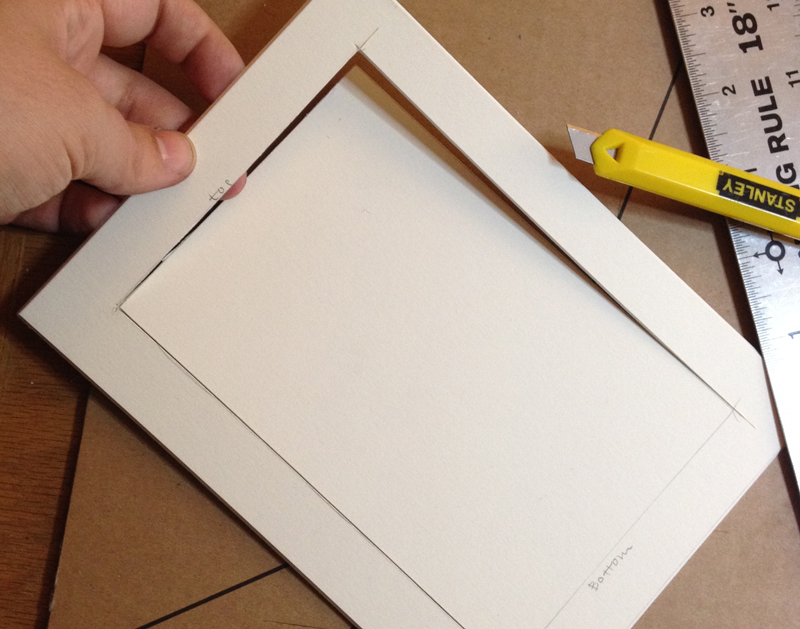 Now you need to seal the inside of the frame too. Otherwise, your plate can slip between the two pieces of mat, which can cause unwanted scratching and gouging. 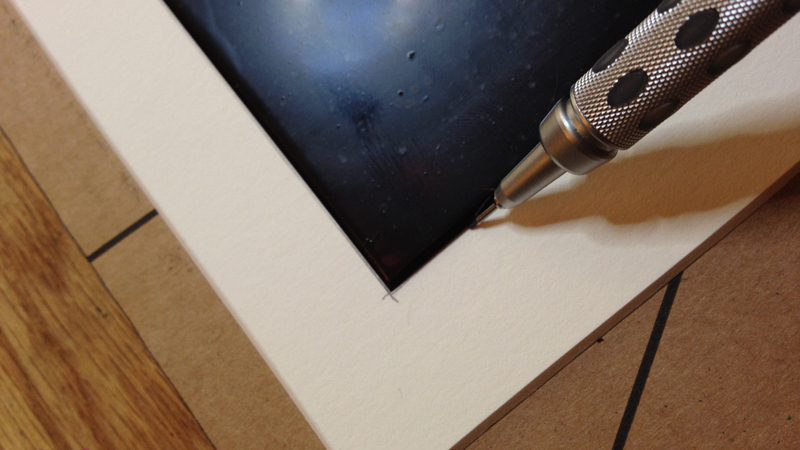 Cut lengths of tape that are narrower than the inside lip of your frame mat, then apply them to each inside edge. I try to avoid letting the tape overlap. Taping the inside edge will keep the plate from slipping between the mats when stored vertically. You could also just apply an even layer of glue between the mats, but then you’d have to wait for the glue to dry. Now to attach the cover mat! Line up your cover mat with the backed frame you’ve just made. 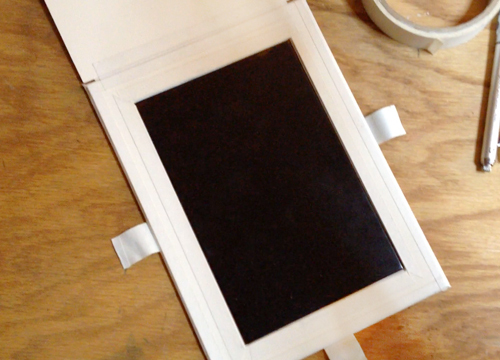 Wrap a piece of tape around the top edge, just like you did to seal the outside edges of the frame mats. Now it’s a functional carrier. Wrap tape around the top edge of your mats, as they will sit when closed. You can stop here, or make a super-duper-awesome mat by continuing on to the next steps. Optional: Lay the carrier open, and apply a piece of tape over the hinge, to cover the sticky side of the tape that shows between the two mats. I like to do this for mats I know I’ll be opening and closing a lot. 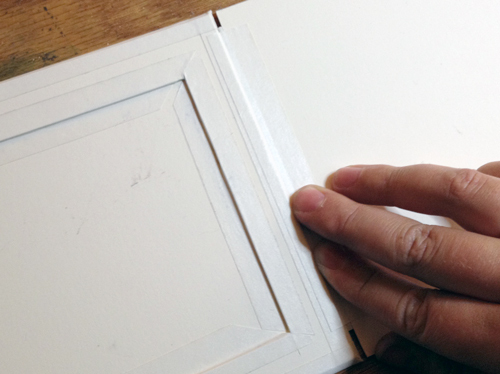 Applying tape to the sticky inside of the tape hinge will prolong the life of the carrier and make it easier to open. Optional but strongly recommended: Wrap pieces of tape around the three edges, right in the middle. The carrier can come open very easily if stored vertically (as in tossing it into a backpack). I will stick pieces of tape to the front side, to give the tape “straps” somewhere to stick that is still easy to peel open again. My finicky, effective method of using tape closures on my etching plate carriers. Ta-da! All ready to go. Now you are ready to take your plate with you wherever you go–perhaps for some plein air drawing directly on your plate? If you’re new to etching, I highly recommend giving some plein air etching a try. It can be intimidating, but it seems to really encourage students to broaden their mark-making and think differently about composition. Heather McLaughlin and I took our CE etching students on a field trip to the Lan Su Chinese Garden for exactly that purpose. It’s one of my favorite places in Portland. It feels magically isolated from the city around it, and the tea house is a real treat. Enjoy! Welcome to Printmaking 101 with Smidgeon Press! This demo covers an essential process in etching: applying liquid ground to a plate. I decided to start making these tutorials to help my non-printmaker followers better understand the processes I use and talk about on this blog. Safety tips are bolded because they’re important! Etching is the process of removing bits of the plate surface using a chemical process (rather than carving directly into the surface). A plate is submerged into a bath of etchant (traditionally called the mordant or acid), which reacts with the surface and eats it away. To make an image on a plate, the artist has to be able to control where the mordant etches the surface. There are plenty of ways to do this, but the most common is by applying a ground to the surface of the plate. There are several types of grounds, but the one we’re dealing with today is liquid hard ground, which I currently use most often in my work. Liquid hard ground is a mixture of asphaltum, wax, and mineral spirits. You can purchase pre-mixed stuff or make it yourself (you may have to test out some recipes before you hit on a successful one). The hotplate will need time to warm up, to go ahead and turn it on first. Make sure the temperature is set around 150°F (66°C). Anything higher than that isn’t necessary, and keep in mind that all of these materials are flammable or combustible. On a work table, lay down your piece of newsprint. Set your copper plate in the middle of the sheet, making sure you have enough room around the edges to hold onto without touching the copper plate. The newsprint will act as backing, to catch your drips (less clean-up!) and allow you to move your plate around without touching it. My newsprint is a bit bigger than it needs to be, but you get the idea. You can also see that this plate has an image on it. I’m applying ground so that I can add more lines to it. Many plates go through multiple etches. Carefully dip your brush into the container of liquid hard ground (or, if it’s easier, pour a small amount of hard ground into a dish dedicated to the purpose). I generally start by applying the ground to the center of the plate and work out toward the edges. The natural temptation is to to start at one edge, but that usually just results in slopping too much ground onto the newsprint and bleeding under the plate. It doesn’t really matter if that happens, but why be messy? This part always looks so pretty to me. You don’t have to start in the middle, but I like to. Don’t worry if you can see brush strokes in the ground, but make sure there aren’t any bristles embedded in it (sometimes brushes will shed, especially if you get a cheap one). As long as the ground is relatively even and no bright copper is showing through, you’re set. Make sure that the hot plate is warmed up before you go on to the next step. It should look something like this: mostly even, no copper showing. If you use a commercially-mixed hard ground, it may look a bit lighter and thinner. Pick up opposite sides of the newsprint, allowing the copper plate to sit in it like a hammock, and set the newsprint-hammock down onto the surface of the hot plate. Let it sit for a few minutes, and it really only needs to be a few. When the ground evens to a glossy, smooth appearance, remove it from the hot plate using the newsprint and set it somewhere to cool. Be careful: the copper will be HOT, so don’t set it on a glass surface or somewhere where it’s likely to be bumped or touched. Heating the ground gives you a smooth surface to draw on and helps the ground dry faster, but it cannot dry completely until you remove it from the hot plate. Remember, one of the components in ground is wax, which will stay soft and pliable until it cools. While your plate cools, clean up. Turn the hot plate off, make sure the lid is on the jar of liquid ground, and clean your brush, or it will harden. You can still clean it if the ground does harden in the brush, but it’s harder than when it’s still soft. This is a good time to put on your gloves and make sure you’re in a well-ventilated area. Pour a little mineral spirits into a dish dedicated to that purpose and gently swish the brush around in it, pressing to spread the bristles apart. Wipe the brush off on a shop rag. Repeat until most of the ground is out of the brush (you’ll never get it all). To condition the brush and make sure it doesn’t harden, add a couple of drops of baby oil to the bristles and gently work it through, either with your gloved hands or on the rag. Make sure you put any dirty rags into a covered, metal container. Let your grounded plate sit for 30 to 45 minutes, then start drawing! Drawing through the ground with a tool will expose areas of copper, allowing those areas to etch. A few weeks ago, I led a chine collé demonstration for the students in Tom’s beginning print class. For those of you who are unfamiliar with the term, chine collé is a French phrase that refers to a technique used in printmaking, where a fine piece of paper (often rice paper) is glued onto a heavier printmaking paper, either before or at the same time as pulling a print from an inked plate. All the prints I did for Stories From the Stone House used chine collé – that’s why the color of the paper behind the image (the rice paper) is a different color than the border (the heavier printmaking paper). I’ll refrain from getting more technical about it here, but if you want more information, don’t hesitate to ask. Chine collé can be a frustrating process. All kinds of things can go wrong – too much glue, not enough moisture, the paper can stretch, the collé paper and the support paper can dry at different rates and wrinkle – the list goes on. I showed a fairly simple, straightforward method using a powdered glue, and also helped some students use a pre-cooked glue paste. Most of the prints came out nicely. There seems to be a tendency toward beginner’s luck with printing, as if we’re all naturally good printmakers until we start to pay too much attention to the process. Most of the students were using Somerset paper, and it’s so absorbent that I think it helped make the powdered glue method successful (by retaining lots of moisture with which to activate the glue). I brought in some kitakata paper, which is what I used for Stories From the Stone House, for the students to play with. One student took a particular fancy to some pink unryu paper I’ve had sitting in a folder for a few years. I used it to print a pretty chine collé on an etching of an anatomical heart. I made it to give out as a Valentine, and I haven’t touched that pink paper since. Really, I didn’t expect anyone to use it when I set it out, but that one student found it exciting. The way she used it was so much better than anything I ever did with that paper. Two student chine collés on the drying rack, with kitakata(birds) and pink unryu (man eating ambiguous blob). That was my first time leading the class by myself. I’ve done printmaking demos before (like the relief demo I did earlier this year), but never with a captive class of people I see in an academic environment every week. I was a bit nervous and probably would have over-prepared, except that my otherwise busy work schedule prevented most of the nitpicking. Actually, I did very little preparation, other than to discuss it with Daniel long enough for him to say, “Yeah, just keep it simple.” It was for the best, I think; it forced me to trust myself, and everything went off swimmingly. I’m very lucky to be able to learn from Tom. His teaching method is almost like magic: you always learn more than you thought possible, without feeling pressured. I hope that I will always be able to bring a little bit of that to every class I (might someday) teach. The class is now doing stone lithography. My guilty confession: I haven’t done a litho on stone since I myself was in Tom’s beginning print class. I’ve been doing all my lithos on aluminum plates (as if I’ve done more than a few!). The stone is more beautiful to draw on, but the aluminum requires so little preparation. I remember enjoying levigating the stone because it was meditative, but I just never had time for all that prep work. Perhaps now is when I should dedicate time to old practices: I could use some meditation in my all-too-busy life. This is also very likely my last opportunity, for a while at least, to work on a stone. Print Arts Northwest (PAN) will be doing montoype demonstrations at Art in the Pearl over the Labor Day weekend, and I will be there. How did I wind up doing this, you ask? As a current participant in PAN’s Emerging Printmaker’s Residency Program, I was offered the opportunity to help out by playing with monotypes for a few hours. It’s been a couple of years since I’ve done monotypes, so I’m at least as curious to see what I come up with as you, dear reader, may be. I’ll have to come prepared with some stencil film; I love making use of that with the monotype process. Come down to the park blocks on Sunday between 10 am and 2 pm if you would like to see me make a mess. Other printmakers will be around the PAN booth playing with monotypes and (if we’re lucky) other print techniques for the rest of Art in the Pearl. This will be my first time going, and I’m glad I’ll be participating rather than spectating.